Neoclassical meets nightclub. If you’re in love with both classic panel molding and cool modern lighting, the two don’t have to be mutually exclusive. Combine neoclassical elements with more modern pieces to bring the look crashing into a present day aesthetic. This amazing bedroom pendant would look at home in a trendy nightclub, but it looks superb set against a backdrop of decorative boiserie. Show a softer side. A cushioned fabric wall, like this suedette little number, looks sumptuous and will even soften sound to aid restful sleep. Ease into an accent colour. You don’t have to go the whole hog with a new hue in a room, in fact, you don’t even need to paint a wall to bring in an accent shade. Try adding colour through art and an accent chair or two – if you don’t like the colour in your bedroom then you can always try putting the items elsewhere in your home. Achieve a more spacious look by choosing a platform bed. The low profile of a platform bed looks sleek, laid back and minimalist in comparison to their bulky based divan counterparts. They also make the room look bigger since the line of sight is free to flow straight over them and beyond. Bump up the luxe factor with bookmatched marble. Bookmatched marble is popular for cladding chimney breasts, sofa walls and yes, headboard feature walls too. A bedroom area rug creates an island of cosiness. Add lighting to textured or extruded feature wall designs for oodles more impact. High ceilinged bedrooms can sometimes feel a bit too open and chilly, consider painting with muted colour or shades of grey to visually lower a lofty ceiling. Approach the scheme as a whole rather than as separate elements. That is, instead of choosing your favourite bed, then bedsides, then closet, then a colour, consider looking at the room as one item. This bed, headboard wall, bedside units and closets all run on as one beautifully coordinated piece. It’s all about the ottoman. There’s just something so high-end about placing an ottoman at the foot of a bed. Perhaps it’s because the average size of master bedroom doesn’t have the necessary floor space. So, if you’ve got it, flaunt it! Create a moody luxury bedroom with a black marble feature wall. Give your bedroom the midas touch, with gold accents and glowy golden lights. Begin and end your day in elegance. A tufted bed base has a refined look, much like a chesterfield sofa. Fashionistas will love fashion forward glass closets, which display a treasured capsule collection from dusk till dawn. Warning: Not recommended for messy clothes hoarders who keep an overstuffed closet and mismatched hangers! Bring in industrial style ideas. Raw concrete and exposed brickwork are just the ticket for an industrial chic outcome. Team with luxury furniture and gold accents to juxtapose the gritty backdrop. Crown your bedroom with heavenly lighting. This halo of light makes a show-stopping statement. Embark on a multi-panel project. The headboard wall is the perfect place to roll out a combination of textures that bring the room together. This one incorporates a centre section upholstered in the same taupe fabric as the bed; dark wood side stripes twin with the flooring. Continue the accent wall upwards and onwards to create a feature ceiling too. Consider moving the bed away from the wall in order to harness more useable floor area. This bedroom incorporates a home office desk behind the headboard. Here, a spacious bedroom with wardrobe has been achieved by moving the bed into the centre of the room. An extended headboard design doubles as a room divider. 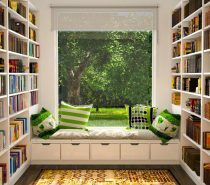 A comfortable reading area offers a place to relax in the bedroom without ruffling up the bedcovers. Create a connection. A horizontal stripe of gold across this headboard wall gives the impression of a connected bed & bedside unit set, even though they are actually separate pieces. Capitalise on curves with a round bed, half moon sofa and curvaceous accent chair. Let the view be your headboard feature wall. This particular feature wall is set to one side for dramatic effect. Add in a surprising accent piece to shake things up. Have an open fronted wardrobe, or a glass closet, double as your ambient lighting. Use large scale artwork to add a bit of culture and sophistication to a bedroom scheme. This towering piece of photography adds a monochromatic artistic touch. Lift a neutral room palette with different textures and pattern. If you’re lucky enough to be building a new dream bedroom from scratch, consider incorporating a courtyard garden. The courtyard will invite extra natural light into the room, and you’ll feel the revitalising effects of having nature surround you. In this bedroom, an extra picture window has been put in above the headboard for extra light and garden views. Taking garden views to the extreme, these floor to ceiling windows run the full length of the room and an outdoor plant bed. The botanical view paints the room green, like a living wall mural. Bedrooms with bathtubs always look decadent. In this one, a small step up to the bathroom area helps to define the space. LED strip lighting marks the edge of the step for both a pleasing aesthetic and for safety. Dress with dramatic drapes. These dark master bedroom curtains hang heavy at full height windows, making the room feel cosily cocooned. A long curtain hangs at a glass wall ensuite in this bedroom, poised to provide privacy. Mirrored headboard walls create the illusion of a larger bedroom area. Include a horizontal stripe of mirror above headboard level, or mount a floor-to-ceiling frameless cut behind each bedside unit. Instead of shying away from offbeat architectural features, accentuate them with lighting and contrasting decor. Purple and black make an opulent master bedroom colour scheme duo. Add in gold bedroom accessories for precious sheen. Dangle orb pendant lights in front of a window for celestial effect. Slatted doors are a cool way to divide the main sleeping area of the bedroom from a walk-in closet, or an open plan ensuite bathroom. The slatted design allows airflow and light to travel between the two spaces. It also allows just a peek of what lies beyond without overwhelming the peaceful sleep zone with all of the added detail of the adjoined room. Divide and conquer. When incorporating a home office area into the bedroom, it’s a good idea to create some kind of visual divide. In this bedroom, the simple desk appears to extrude straight out of a dark wall section, with the bed and bedsides attached to lighter wood panelling. Tie it together with a wrap of colour. A wide purple bedroom stripe wraps these walls and ceiling. Purple pillows and scatter cushions continue the theme. Don’t underestimate the power of a great colour. Simple pieces furnish this blue bedroom, but the rich and saturated colour treatment makes it into a special room. Another clever mirrored headboard design – this time with etched glass. Seek a Yin and Yang balance of darkness and light. Huge sunny windows can afford a room to embrace a deep and dark colour scheme, like this deep stained wood and dark grey bedroom. Screens close across these windows to dip this black bedroom further into darkness. Layer up a minimalist look by placing a platform bed on top of a partial platform floor. A low level bedside volume completes the sleek linear look. This partial platform floor has risers that morph into a morning coffee bar, and a warm seating nook by a wood burning stove. Not a fan of strong colour? A hint of a tint can make all the difference. Raw brickwork is a great way to colour a room without commiting to paint selection. Carve out a rugged rustic bedroom. Textured stone walls, bare timber, a branch chandelier and a log burner make the perfect hideaway.